Teaching Traveling: How did a Canadian couple find jobs teaching abroad when they didn’t have teaching degrees nor TEFL certification? 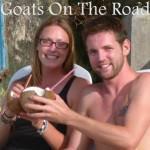 Read and learn from Nick and Dariece, “Goats on the Road.” Take it away, Dariece! 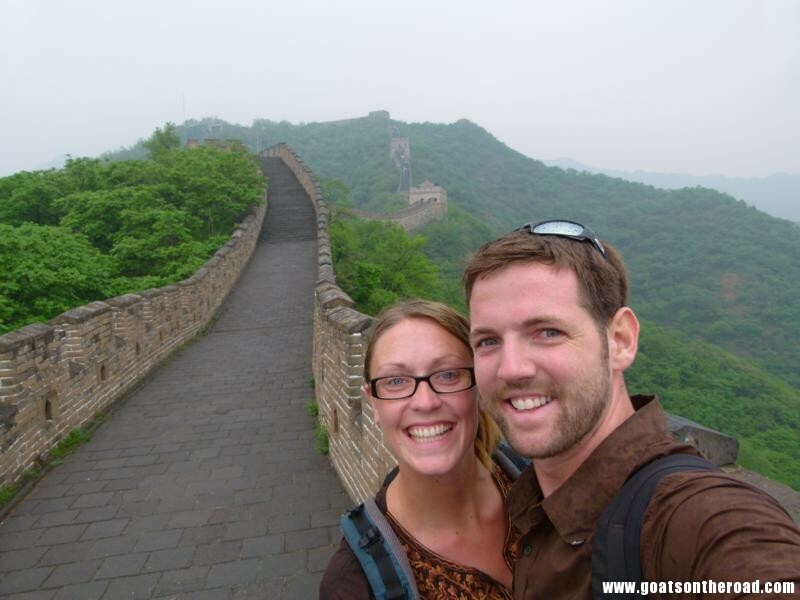 Dariece: We are Nick & Dariece, a 20-something couple from Canada. About 4 years ago, we decided that our current professions weren’t for us anymore. I was a paralegal at a law firm and dealing with the stresses that came along with the job could take years off of my precious life. Nick was a printing press operator and the graveyard shift hours and chemicals he worked with could literally take years off of his life. As you can imagine, this did not seem ideal to us. We decided a change in lifestyle was in order and we sold everything, saved as much money as we could and planned a trip around the world! Planning our trip around the world. We were focused on SE Asia, India and Sri Lanka. At this point, being a teacher hadn’t even crossed our minds, we were enjoying the freedom of travelling. 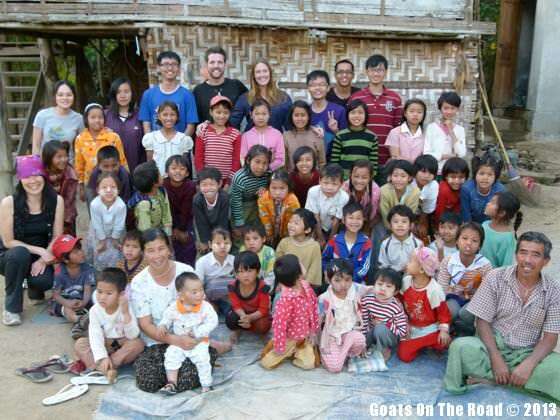 When we got to Laos, we saw an opportunity to volunteer teaching English to teenagers and we jumped on the chance! It was only for a few hours, but that experience made us think that we could potentially be English teachers one day. 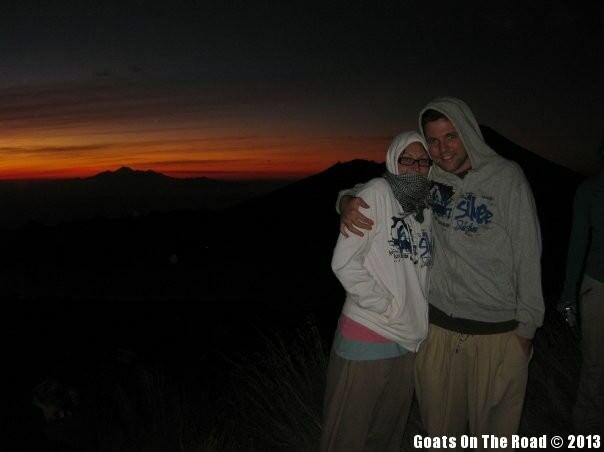 Me & Nick at the top of a volcano to watch sunrise! Bali, Indonesia. After 13 months of travelling the world, we went back to Canada for one year… to the same jobs! We saved like we’ve never saved before because we knew we wouldn’t be coming back to “normal” jobs ever again. We set off on another epic trip. We left in February, 2011 and have been travelling ever since. This trip has taken us from Europe to Africa, The Middle East to Asia and into the Caucasus countries. 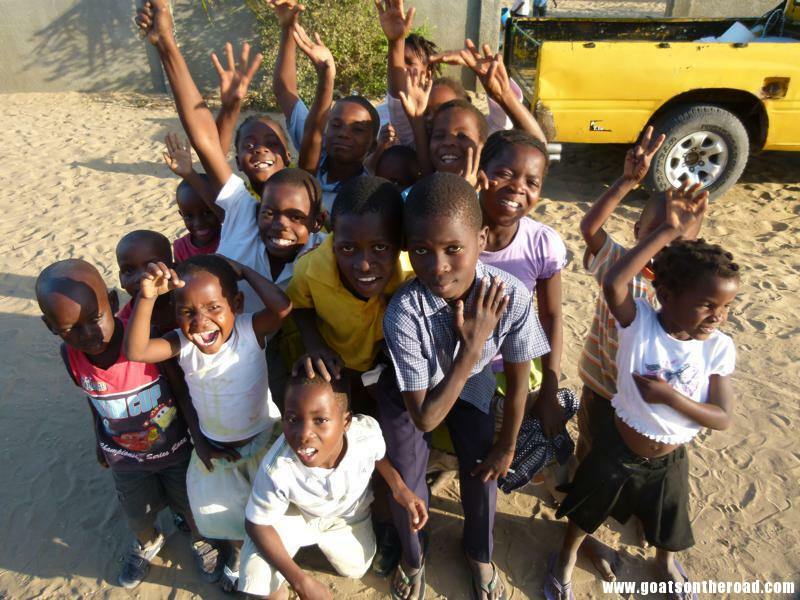 Happy children outside of a church in Vilanculos, Mozambique. 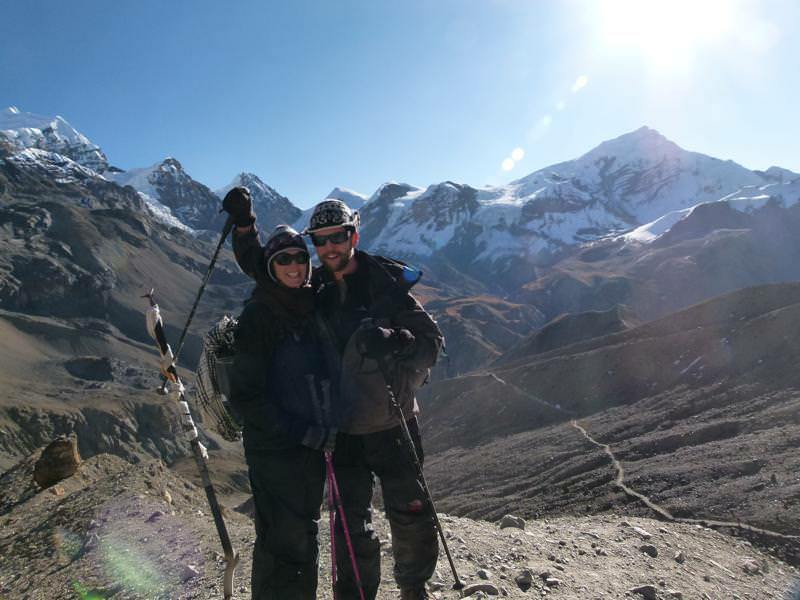 Us on our way to the Thorong La Pass high in the Himalayas, Nepal. While we were backpacking through Myanmar we came across the little Village of Naloy. A woman from Taiwan had set up a very basic school, and by school I mean 30 or so village kids sitting on a tarp on the dirt, pigs & chickens running around and villagers gathering around to watch a lesson. We were invited to volunteer with her and help out in any way we could. It was such an amazing moment in travel for us! We spent 8 days there for about 5 hours each day. We really got to know the children and the village leaders. We spent each night there having home cooked meals in their small bamboo thatched home, a truly memorable experience for us. The kids were adorable and the whole idea of this little village school was fantastic. Our wonderful class in Naloy Village, Myanmar. It was so hard to say goodbye to the village students in Naloy, Myanmar. We left Myanmar with a full heart and smiles on our faces. We knew that we would really enjoy being English teachers. We continued on backpacking the world as planned. Our savings started dwindling at the year-and-a-half mark, right about the time we were in Hong Kong about to go to China. We had heard that it was easy to get a teaching job in China and we decided to send out some resumes to schools that were looking to hire (check out the job board on ESL Dave). We sent out emails on Friday and on Monday our inbox was full and our phone was ringing off the hook! Turns out China really wanted us… even though we don’t have university degrees or TEFL as required in most countries. Travelling through China while sending out resumes for an English teaching job. We ended up signing a one year teaching contract in July, 2012. We have been living in Yangzhou, China since then and are currently at the 6 month mark. We love living here and the teaching experience has been one we’ll never forget. Our students are adorable, the hours are great, the pay is pretty good and the joy we feel when we see those precious little faces looking at us is priceless. Me with my 3 adorable kindergarten students. Yangzhou, China. Teaching English overseas is the perfect job for those who want to make money while still feeling like they are travelling and experiencing new cultures. It’s a job that you can do all over the world! When our contract is up in July, we will be taking some time out to backpack through Mongolia and Central Asia and then searching for our next teaching English job. We don’t have a particular country in mind, we’ll just go with the flow and see what comes our way, so exciting! If you thought you weren’t qualified enough or don’t have the right degrees and certificates, think again. We received an extensive, paid training program when we got to China. This saved us time and money and taught us everything we needed to know about classroom management and teaching English to young learners. There are many countries that will let you teach without this paperwork. If we can find somewhere, so can you. It’s time to leave the mundane routines of home behind and try something fulfilling and new! Nick & Dariece have left everything behind in search of cultural experiences, beautiful beaches and off the beaten path adventures. 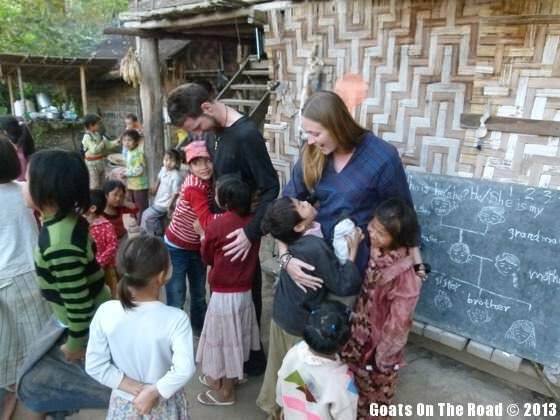 They call themselves Goats On The Road and their website for budget backpackers encourages others to pack their bags and leave the ordinary behind. 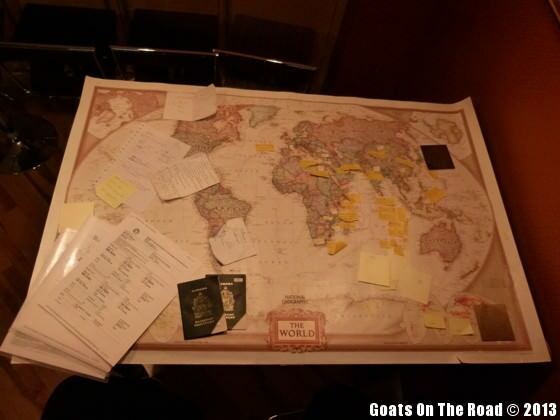 Visit Goats On The Road and get excellent tips for the adventurous budget backpacker! Hello, I love this post! My fiance and I are trying to teach english in the Eastern World. We have only an associates degree and not enough money to pay for the TEFL certification. On Daves job board did you post a resume?? and did you only get offered for jobs with contracts for long periods of time?? Great questions! I look forward to hearing the replies. Best of luck! I am a journalist looking to find a village called Naloy in the Shan state, was it near Lashio? I will be very happy if you reply, as the matter is important. Naloy Village is near to Hsipaw, we walked there from downtown in about 30 mins. Ask around there and they’ll point you in the right direction. You are living my dream! It looks so romantic, you are really lucky to have a partner that has the same interest in travelling! iâ€™m zahra from Iran. i have a BA degree in English language and literature and also a MA degree in linguistics. ive been teaching in two universities for 2 years and at the same time im teaching in different english institute. but i really really really wanna change my work place and have new experience of the kind you know. unfortunately i dont have a TEFL certificate. also im not a native speaker of english. do you thing can i participate in one of the volunteer or any good paid job to lead the life ??? i wrote the question before , but no answer!!!!!!!!!!!! Zahra, I don’t know any specific opportunities, but I know they are out there! Keep looking, and best of luck! i’m zahra from Iran. i have a BA degree in English language and literature and also a MA degree in linguistics. ive been teaching in two universities for 2 years and at the same time im teaching in different english institute. but i really really really wanna change my work place and have new experience of the kind you know. This is very interesting! I didn’t know that you could teach abroad without a TEFL certificate. While I know I don’t have the patience for teaching children, I have thought about teaching adults. Thank you for sharing your experience! I love this! I’m currently “in-between” jobs, and traveling is something I’ve been wanting to do for a really, really long time. I always use not having money as an excuse. But I think if I build up enough courage and finance, teaching English is something that I’m leaning towards. Just go for it! It’ll all work out. Teaching English is a great job for people who love to travel, or people who are “in-between” careers. I concur. You can definitely do it! Just know what visa you need before you go. Sometimes the process takes a while. Hi! Thanks for the great articles. Wondering how you find the pollution in China. I keep seeing pics of people in a dark fog…wearing masks. Other than avoiding the big cities – how to avoid it? Also wondering how it would be for a single woman? Other English speakers in your city? Hi Helena! Thanks for the comment. As a single woman, it would be great! The women here are really friendly and will try to speak with you any chance they get (and will want photos with you) and the men are respectful. You would have no issues, we know many single women here. The English speakers in our city consist of our foreign friends and the Chinese teaching staff at our school! Very little English is spoken here. In places like Beijing and Shanghai, English is much more frequent. Our city isn’t touristy and therefore they haven’t needed to learn English…but that’s all part of the challenge and we love it! Hey there, great post! I taught in SK for a couple years, and I’m always curious about people’s experiences in China because they differ greatly. I have a couple questions for you if you don’t mind! 1) Since most people don’t speak English, do you find it difficult to communicate and get around? For example, ordering food, taking a taxi, going to get laundry done (if applicable)? 2) Any big challenges you faced in the work place? 3) What are/were your benefits like? And, was the administration open to hiring you both as a couple? Some schools prefer single teachers, and some schools don’t mind couples. Hello Alexa, thank you for the comment! Almost everyone I’ve talked to has had great experiences teaching in South Korea (I’m assuming that’s where you meant by “SK”?! ), I’ve heard good and bad things about teaching in China. However, the ‘bad’ experiences were due to people not making sure their teaching contract was legit, making sure they would have proper help from the school with regards to living in China as well as with the job itself. I feel that if you do your research and don’t just sign the first contract you see, then you’ll have a great experience! 1. This depends on which part of China you live in. If you’re in Shanghai or Beijing, many people speak English. If you’re in Yangzhou (where we are) where no one speaks it, then you’ll have to pick up some Chinese and get used to using hand gestures! We have learned many of the basics and we can get around and order food ourselves. We have also had Chinese friends write certain things in Chinese so we can just show that to a taxi driver, or a shop or whatever. We feel like it’s all part of living here though and it really makes for interesting days! 3. The benefits are good. We have a housing allowance each month, medical is paid for, we get retention bonuses (if we keep a min of 9 kids per class we get some extra cash), our taxis to school are paid for, flight to and from home and a bonus at the end of the contract. Thanks for allowing us to post our article on your awesome site Lillie! We hope it inspires others to make a lifestyle change and try teaching English. 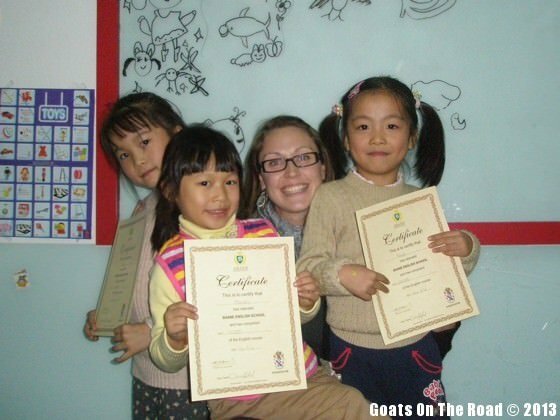 It’s possible even without TEFL! If we can do it, so can others. Teaching in Hong Kong With a Better Salary Than the U.S.